As an avid reader, my thirst for good books belonging to different genres is never fully satisfied. However, I rarely stick only to the best and well known writers from past and present and often take up books that feature the work of upcoming writers. It was this search for variety that led me to choose The Untold Love Stories as my next read. 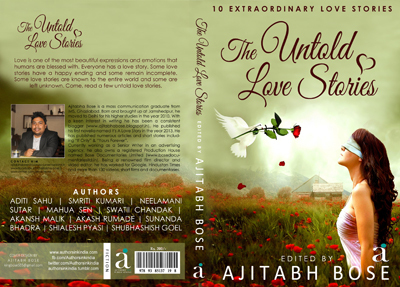 The book features 10 short stories on the theme of love by various writers. I was actually quite excited by the fact that I will be reading quite a few romantic tales which would be short and crisp, which is something that I guessed from its well designed cover. The fresh and heartwarming appeal of the stories touched my heart. The first two stories did not prove too appealing even though the writers had made sincere efforts to present them in a unique manner. However, I was soon pleasantly surprised as the subsequent stories proved to be not only interesting but also realistic. My excitement not only returned with full vengeance but even grew as I read through each romantic tale that seemed to have been inspired by some real life incident. I enjoyed every moment of going through the book and the overall experience was really awesome. I was especially impressed by the stories titled “Enchated” and “Love is Sacrifice”. When I finally finished the book I was really impressed by the talent and creativity of every single writer. That is why I can safely say that with time all the writers featured in this anthology can reach great heights of success. The review of his book would never be complete without appreciating the efforts of Ajitabh Bose, who not only took up the task of compiling this book containing the work of all these talented writers, but also handled the responsibility of editing the book. Given that the book provided good entertainment from start to end, I give it a rating of 4/5 stars.